No matter what anyone says, words do hurt. They may not break bones but the wrong words said in the wrong way can break a spirit. We have all been there before in one way or another. Words are how we communicate with others and they’re very important. Think before you speak to avoid hurting your child more than you may imagine. Nobody wants that. 1. Check Your Tone — Anything you say affects your child, and if you use a mean tone, or a hateful tone, they remember that tone more than what you said. It can be very hard but keeping your tone of voice level, loving, and parental is an important part of learning to parent well. 2. Avoid Comparing — You’ve probably thought it. 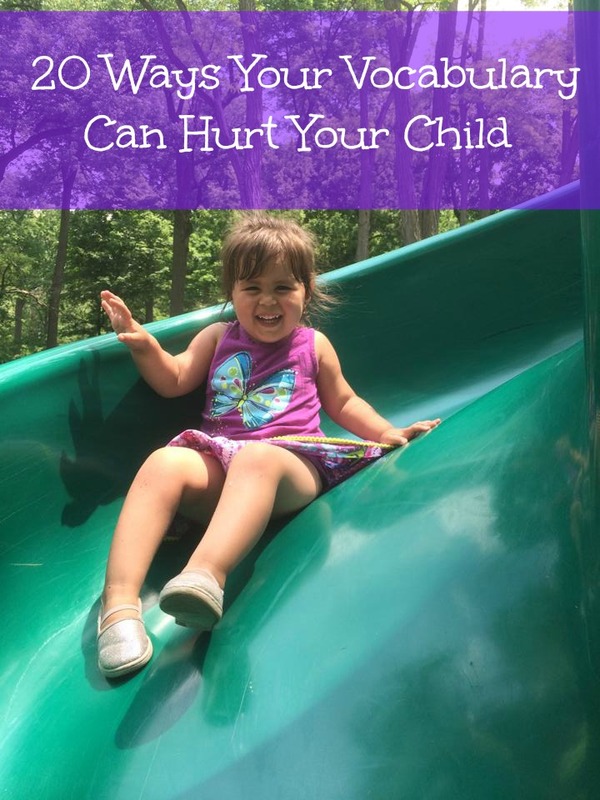 “why can’t you be more like …..” or “Why do you have to be like ……” this is a very dangerous road to travel with your children and can be very painful for them to hear. They are themselves, and they aren’t anyone else. Treat them accordingly. 3. Don’t Accuse — Even if you know for a fact a child lied, yelling “You’re a liar” is not going to get the results you want. It’s best to use the facts you have, and set the consequences without yelling mean things that you can’t take back. 4. Don’t Say Things You Can’t Back up — “I’m going to send you to live in a foster family.” “I’m going to smack you into next week.” These are phrases that hopefully you have no intentions of doing (only in your head) and should not do, if you can’t do it, or won’t do it, or it’s wrong to do it, don’t say it. 5. Don’t Ask Rhetorical Questions — If you know the answer, or don’t want an answer, don’t ask. Simple! Asking a child a question and then telling them to “shut up” is a waste of time and will not solve any problems. Probably make things worse. 6. Don’t Be Demeaning — It can be very hurtful to call your child an “idiot”, “stupid” or to tell them that they can’t do anything right. Don’t do that to your child. It’s not true, but you can make it come true if you repeat it enough. Nobody wants that, right? 7. Don’t Disregard Feelings — Don’t ever tell your children that they’re feelings are ridiculous or silly. It can be tempting when dealing with teen drama, and boy friend or girlfriend drama. But all these emotions your child has are real. They feel real hurt, real love, and real disappointment from the people they call friends. Be there for them. Remember you were their age once. We all were. 8. Don’t Give Up On Your Child — It’s normal to get tired of children who are expressing bad behavior, but don’t use phrases that suggest you’ve given up such as “I’m done” or “I’m through with you” or other things like that. This can be very hurtful. Cutting off a child from your affections can be very scary and cause wounds that may never heal. We all say things out of anger. Just be careful. 9. Don’t Sink to Their Level — Never tell a child “I hate you too”, or “I wish I never had kids” or other hurtful phrases such as that. Even if a child yells that at you, just keep loving them and letting them know you love them. They’re children. You’re the adult. 10. Don’t Label Your Children — You’re lazy, you’re the pretty one, you’re the dumb one, you’re the smart one — good or bad, labels should not be placed on children. They add pressure that doesn’t need to be on the child, and the bad labels can prevent a child from being all they can be. 11. Don’t Exclude Your Children — When you are talking to another adult about your child, don’t act like they’re not in the room. Include your child in the discussion about him or have him go to another room where he can’t hear. 13. Don’t Have too High of Expectations — Children are going to be children, they can’t do the same things adults can do. Telling a child to “do his best” might have bad connotations since a child has nothing to compare it to. Instead, tell them to have fun. 14. Avoid the “Do as I say, not as I do” Trap — We’ve all said it… But, there have never been 8 words more destructive. Children need more information to make informed choices when you are not around. Give them to them. 15. Don’t Yell or Scream — Yelling and screaming, no matter the words you’re saying will take a toll on your child. Plus, it demonstrates very poor self-control and the main thing you want to teach your child is self-control. Guilty once again. 16. Avoid Negativity — You’re going to have to say no, nothing is wrong with no, but if everything that comes out of your mouth is negative, children will learn to switch off your voice. 17. Don’t Tease Children Too Much — “Can’t you take a joke” is a common thing you’ll hear some parents say to their children when they start crying when being teased. You have to remember that children do not have the same frame of reference as we do, so they cannot take a joke in the same way. 18. It’s OK to say “I’m sorry” — If you want your child to say “I’m sorry” then you need to say it too. They DO hear everything after all. Avoiding saying I’m sorry when you’ve messed up is a bad way to teach your child to care about other people. Adults make mistakes, teaching them that you’re infallible is a problem. 19. Listen Without Interruption — Super important! When you ask your child a question it’s imperative that you listen without interruption to what they have to say and validate their feelings. If you interrupt them and coldly require absolute submission you’re only creating a child with low self image, not a strong adult who can make good choices. Plus, they will learn to interrupt you as well. 20. Give Good Reasons — Avoid the “Because I Said So” approach with children. It doesn’t work and causes resentments which can lead to behavior problems. Instead, respect your child enough to give them a reason and if there is ever a real serious reason to not give them a reason, they’ll actually take you more seriously. You want the same from them. Words are very powerful, use them wisely. Good parenting isn’t easy. I’m no where near perfect, just good enough to not screw my kids up. That’s the goal anyway. Teach! With a Summer Scavenger Hunt! What a great article! I invite you to share your post at http://howtogetorganizedathome.com/monday-madness-january-5th/ I think our readers would love it too!